You end up on the ground level to fight against a Darknut. Attack him as usual or make it fall to create the first warp tile (finally! ), then go north. Climb the stairs on the right, pick up the Compass from the chest, then climb the stairs to the left. Go north and east, jump into the hole in the middle and open the chest to get a Small Key. Go back to the second floor and this time go down. Break all the pots, create two clones on the slabs number one, three and five, then go south. 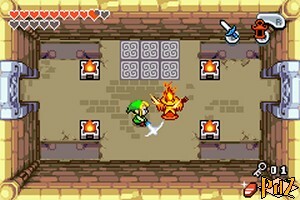 Stand in the middle of the switches and swing your sword to activate them. Go left, use the Roc's Cape to get past the rolls and climb the stairs. Pick up the Small Key from the chest, go towards east and open the door. Fly between the torches, then go through the tornadoes in a circular counter clockwise way to go northeast. Go north and activate the two switches with a Spin Attack to create a shortcut, then come back south and climb the stairs to the third floor. To get a Kinstone, go west, jump into the hole, get rid of the two Wizzrobes, then go right and climb the stairs again. Go north and west. Get rid of the three Wizzrobes, then get the Map from the chest! and go left. Get rid of the two Wallmasters, then pull the lever and swiftly go down. Climb the stairs towards the fourth floor. Go left and up, push a block into the void, go across and go up. Pick up the Piece of Heart at the end of the path, then come back down, jump into the hole, go down and go back to the fourth floor. 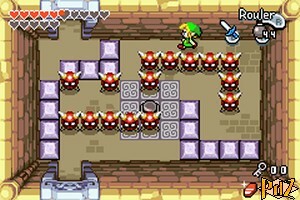 Now go right and shoot an arrow at the enemy when it gets close to the cracked blocks to destroy them. Fly to the right, then go straight away to the north until you reach a chest. Take a bomb, lift and toss it next to the switch, then use the Cape to cross from the left, go thought the door to the north and get 200 rupees from the chest. Backtrack and this time, go all the way to the east, to the north and light the two torches to create a second warp tile. Open the door at the bottom and go to the fifth floor. Blow up the wall on the right, go ahead, go north and drop a bomb next to the wall right above the columns. Blow up the cracked wall and go up. Go around the enemies without blowing them up so the switch is not triggered, then push the two blocks in front of the passage and go up. Open the chest to get a Small Key, then go down twice and fall through the cracked floor. Open the door, follow the path to the north, then to the southeast (there is a Kinstone in the chest.) Push the two blocks in the void, fly and go north. If you want another Kinstone, fly east, jump on the clouds and go right. 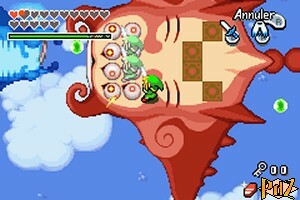 Jump on the clouds to go back to the fifth floor and open the boss door. Climb the stairs and jump into the tornado. To begin with, you will have to create two clones on the slabs according to the opened eyes of the red monster. Then hit his eyes as much as possible. Then a blue monster will arrive, jump on him. Hit his open eye while being careful of his tail that is trying to make you fall. After a few hits, he will drop you back on the red monster. Create two clones again to hit the eyes, but this time the blue monster is shooting bubbles that you and your clones must avoid. To do so, try to charge up your sword a little afar, on a wing, and then stand on the slabs. Then, you will have to get back on the blue monster and attack his open eye, this while attacking or avoiding the little green monsters. When the blue monster is destroyed, you end up on the red monster to deliver the final blow. Hit the green enemies to refill some hearts, then create two clones to attack the eyes of the monster and defeat the monster himself! You will then be rewarded with the Wind Element. Pick up the Heart Container and step on the warp tile.